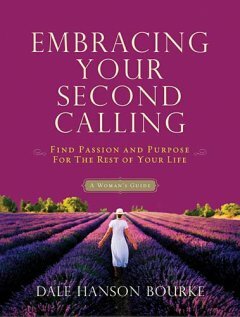 I have been reading "Embracing Your Second Calling" by Dale Hanson Bourke. It's a book about "finding the passion and purpose for the rest of your life." When the kids are grown, what is a woman to do? Does life as we know it end? Certainly not! This book will help you to stop living in the past, stop trying to be who you once were, and press on toward the future that God has waiting for you. I found this book to be very inspiring. It really made me think about my future... not that I haven't been thinking about it anyway. The author shared from her own experiences along with using the Biblical example of the life of Naomi. It made it very personal for me. Not at all 'preachy'. More of a sharing between friends or acquaintances. Also includes some study tools in each chapter - which I initially thought were not useful - but as I read along, I found that I actually enjoyed reading them. I did enjoy reading this book. I found it very helpful just to know that other women (and men) have some of the same experiences. I would recommend this book to other women (and men) who are faced with the question of "What now?". God isn't finished with us!